Alina Pogostkina is a Russian violinist born (in Leningrad) on November 18, 1983. She began her lessons at age 4 with her father and gave her first concert one year later. When she was 8 years old (1992), her family moved to Heidelberg, Germany. According to one source, she and both of her parents - both are violinists – for some time made a living playing on the street. Marie Hall did essentially the same thing in England, though without her parents. Pogostkina is said to favor modern music. She attended the Advanced School for Music in Berlin, studying with Antje Weithaas. Along the way, she participated in several competitions, eventually winning the Jean Sibelius Competition in Helsinki in December of 2005, using a modern violin by Falk Peters. She had already won the Louis Spohr Competition in 1997 (Freiburg, Germany) at age 14. She also participated in the Queen Elizabeth and the Indianapolis Violin Competitions (2001 and 2002, respectively.) Pogostkina now plays all over the world, accompanied by the best orchestras and the best conductors. She also participates in quite a few music festivals around the world. Her sound and technique is similar to Hilary Hahn’s – very crisp, emphatic, and clean with flawless intonation - but her musicianship is different. YouTube has a few videos of her performances. One is here, showing a complete (and spectacular) performance of the Sibelius concerto. For a while, she was playing a 1709 Stradivarius violin, a loan from the German Music Instrument Fund. 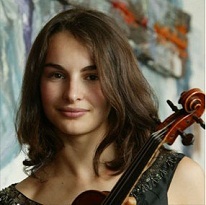 Pogostkina now plays a modern violin by ChristianBayon. Of course, if you are a regular reader of this blog, you know I absolutely favor modern violins over any old instrument. The reason is that they are at least equal to any Amati, Strad, Guadagnini, Goffriller, or Guarneri and, in most cases, much better. I love her Sibelius !. Is this violin the new one? It sounds spectacular ! I think she used the Falk Peters violin for the video performance but I am not sure. I will ask her and post the answer here. Promise!! In this video she is not playing on my violin, she have it only since March 2012. Very Good Article Thanks For sharing! Hi Very Nice Blog. I Have Read Your Post. It Is Very Informative And Useful Thanks For Posting And Sharing With Us And Your Writing Style Is Very Nice.